Is Your House or Condo Ready for the Storm or a Major Disaster? This month is Disaster Preparedness Month in Seattle, and with the impending storm bearing down on Seattle, no better time than now to prepare and share some ideas to help you be prepared. 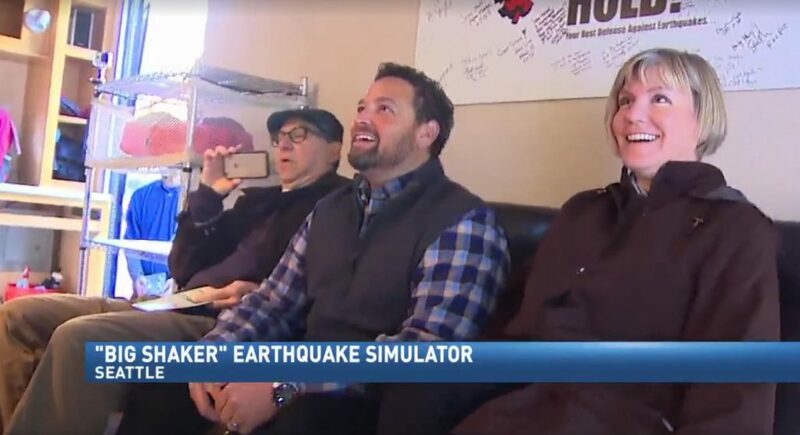 This week the city of Seattle hosted the Shaker Trailer, which is an earthquake simulator. I took a ride on this thing and it was a simulated 8.0 magnitude jolt which, I’ll tell you, really gets things moving and shaking big time! Here is video of us in the simulator from Komo News. Getting ready for the “big one” will also have you ready for this weekend’s severe wind and rain, which could potentially knock out power to your house or condo. Here are some quick tips that you can do rather quickly to prepare yourself for the weather this weekend, and even for 8.0 earth shaker that might come someday. Have flashlights and battery powered lanterns along with extra batteries ready. If you use candles, be very careful as fires are a big cause of property damage during power outages due to careless open flames. Blow out the candles before going to bed or leaving your home. If you want to ensure you have power and you live in a house, you can purchase a generator to keep your power up and running. However, if you live in a condo know that though some condo buildings have backup generators, they can still experience power outages, so prepare for that. The generators often are only designed to power the building’s emergency systems, common area lighting, elevators, garage doors, etc. It might not power your condo unit. Check with your facility manager to find out what is powered by the generator. Secure things on your decks or patios and in your yards, or bring them inside. Flying furniture, umbrellas or BBQ’s can fall over and smash into your windows and cause damage or worst case if you live in a condo, can fall off your deck and really hurt someone. If your fireplace or natural gas cook top in the kitchen use an electric ignitor, you should know how to manually light your appliance in case you need it while the power is out. For those who have electric powered furniture or medical devices such as home oxygen, electric breathing nebulizers, electric recliners or beds, you should find out if you have a battery backup on that device. If not you could be stuck without out important medical interventions, or you could get stuck in your chair or bed if the power goes out while you are in it and it reclined with the feet up. You can buy batter back-up units that you can plug things into to get you by for a short time if the power is out. To be truly prepared for a large earthquake takes time, but here are some quick things you can do now. Below are links to more information on building Emergency Preparedness Kits for your home and the office, and information on getting trained and prepared. Secure large appliances, bookshelves and cabinets to the wall. Leading cause of injuries in earthquakes is from falling objects hitting people and the resulting glass breakage from falling objects. There are ready made home retrofit kits you can get at local hardware stores. Store supplies to get you by for 7-10 days. Yes, at least a whole week. It will be a very long time before the city’s emergency workers and public resources will be available to help individual condo and home owners. Food, water, medicines, pet supplies, etc. should be in your emergency supplies. Connect with your neighbors on your block or in your building and find out who has special training, skills, or might have supplies they would be willing share in the event of major disaster. Get training and learn how to prepare. A lot of free classes are available and taught throughout the city by the Office of Emergency Management. Here is link to their Facebook page! In the city of Seattle, the Office of Emergency Management strongly encourages communities to organize, train and prepare as neighborhoods. These are called SNAPs (Seattle Neighborhoods Actively Preparing). For homes, it is usually a few blocks that work together, and for condo living, a SNAP can be your condo building, or for larger condo buildings a SNAP might be a grouping of floors, and your condo building may have several SNAPs. Then, on the community level, entire neighborhoods are encouraged to report to a HUB which is a designated spot for gathering and sharing information and resources with one another and for reporting to the city’s Emergency Operations Center, which will be activated in the event of major emergencies or disasters. Know where your local HUB is so that you know where you can go for help, and also important is to know that the HUB is a place you can go to offer your help and skills. If your neighborhood or building does not have a HUB close by, then you might consider establishing one with other volunteers from your building and your community. Click here for a map of where current HUBs and SNAP’s have been established. South Lake Union, for example, is working on creating a HUB since one does not formally exist. Live in South Lake Union or Denny Triangle and want to help, let me know. Being prepared is the best way to minimize the impacts of a major disaster, and will also help with speeding up the recovery after as well. I hope you can take just a couple of these steps and put them into action. Just start small, but the key is just start.